I just repotted my baby bird of paradise plant and thought it would be a good time to do an update and see how things have been progressing. I bought the plant in February and it has been thriving. When it arrived, the little tropical baby had seven tiny leaves and was about 12″ tall. 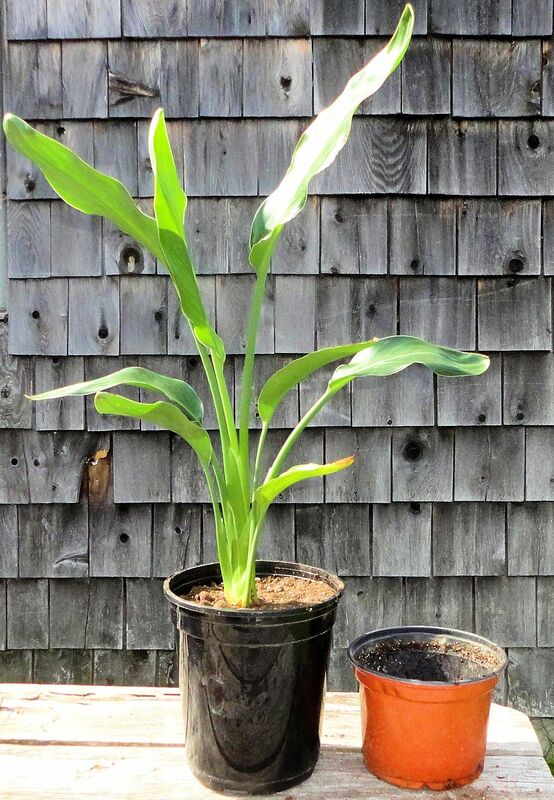 Now it has eight leaves, most of those are new growth, and is 21″ tall. The root system on bird of paradise plants is extensive. The thick, white roots resemble snakes. They coil around the inside of the pot and crawl out through the drainage holes. Using the power of hydraulics, the roots slowly break apart any pot that holds them. In the above photo, the plant stands in its new pot with the old one beside it. The root space is doubled. The roots take up about two-thirds of the area of the new pot. Within six months, if all goes well, the roots will start groping out the bottom of the pot again. Bird of paradise plants usually bloom in late summer. This baby is still too young for flowers. They sometimes need as long as seven years of growth to bloom. Somehow, I think this plant will flower before then, it has very exuberant growth and seems determined to grow up quickly. 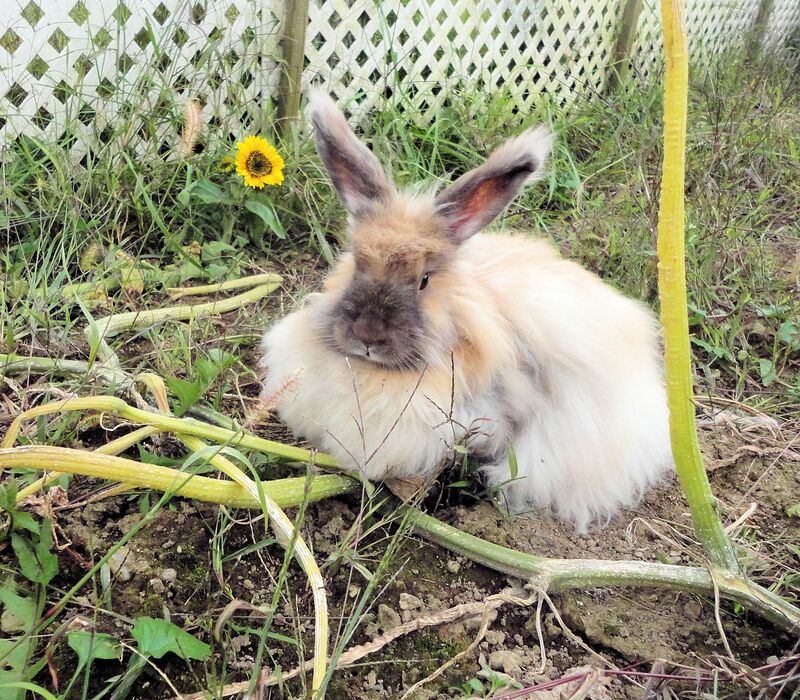 This entry was posted on September 28, 2014, in Cultivated Plants, Uncategorized and tagged bird of paradise plant, cultivating bird of paradise plants, house plants. There, I’ve got my little roadside farm stand of excess garden produce all set up and open for business. So far, one sale. It is a very nice day with temperatures in the 80s. Most people are not likely to be thinking about buying fall decorations. I’ll open the stand up on decent weather days when I’m around and once there is a chill in the air, more customers should stop. Most years the farm stand is fairly profitable. The pumpkins for Halloween carving and the dried corn stalks are always the most popular. I only have a few of each so it won’t take too long to sell out. 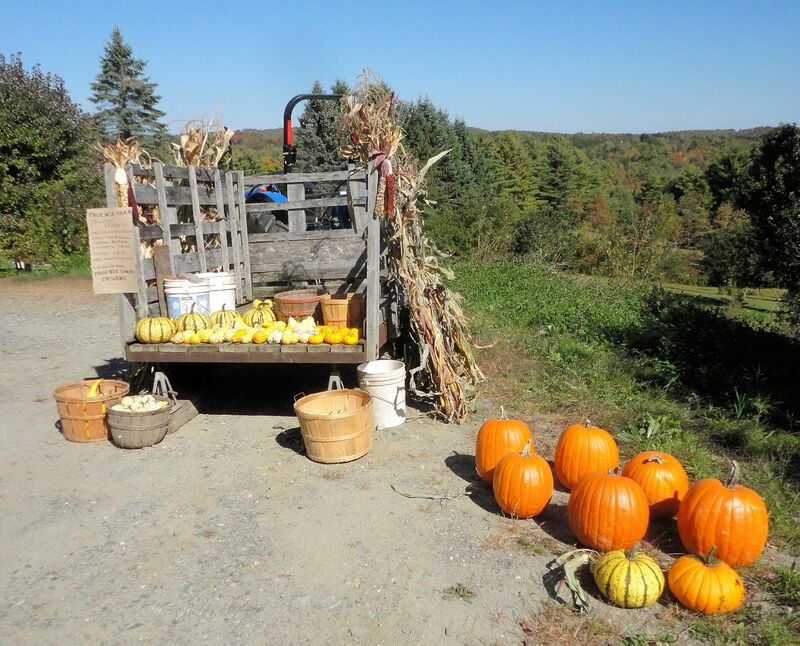 There are so many extra gourds that most of those will probably go to the horses and chickens. They seem to enjoy eating them. 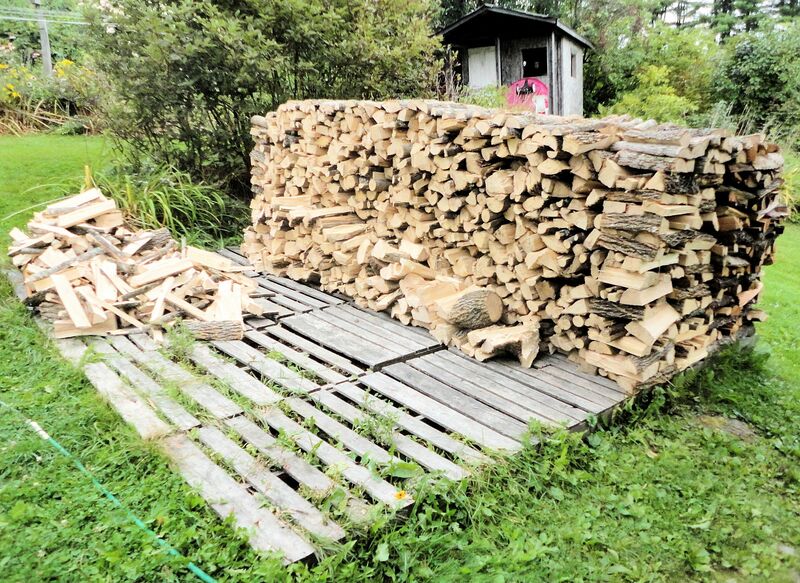 The annual struggle to complete the woodpile has so far resulted in a stack of about half the fuel we need for the winter. We burn through six cords of firewood, heating our 1700 sq ft house entirely with wood. We only use the backup electric heat if the temperatures dip very low or if we will be away for an extended period. 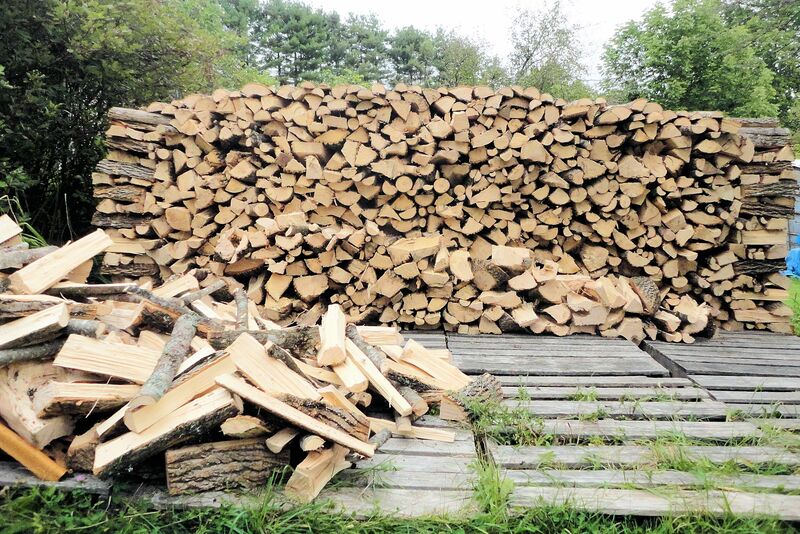 Good firewood has been allowed to dry, also called cure or season, for a good year prior to burning. Most years we are able to do that. This past year, the lumberjack (my husband) suffered from more than the usual amount of back pain and was not able to get as much wood on the ground as normal. Also, the long, cold spring forced us to burn several cords of wood we intended for this year. We have been cutting mostly ash which burns even when wet. The ash has had a chance to dry anywhere from three to ten months at this point. Wet ash will burn with a lot of hissing of escaping steam and not produce as much heat as dry wood. To get the temperature up in our high efficiency wood stove, we must add a few dry pieces of wood with each load of ash. The best ready supply of dry wood is dead elm trees. The poor elms rarely have a chance to get large or old due to the continuing presence of Dutch Elm Disease. The fungal infection kills elms within a year, filling their fluid transport systems with thick hyphae growth. Because elm wood is dense and tough, dead trees can remain standing for many years. After a couple years, the wood is quite dry. I scout around for dead elms. The driest ones have begun to shed their bark. Loggers call dead trees widow makers because the vibrations of sawing them can cause branches overhead to rattle loose and drop on the wood cutter. Luckily, with elm, the wood is so tough that widow makers aren’t a problem until a dead tree has stood for many years. We knock down the trees, strip off any remaining bark and split them up with our commercial size hydraulic wood splitter. The dry, tough wood is very hard to split by hand. Just one good piece of dry elm will bring the temperature in the burn chamber up enough to vaporize the moisture in five or six pieces of half-cured wood. 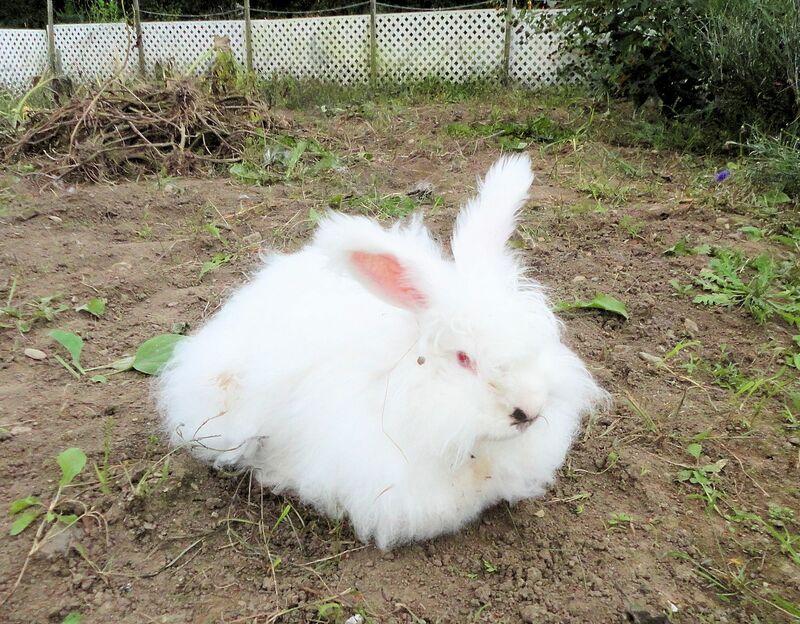 This entry was posted on September 21, 2014, in Family, Farming, Handy Tips, Musings, Uncategorized and tagged ash trees, burning firewood, cutting firewood, elm trees, farm life, firewood, heating with wood, rural life, wood heat. 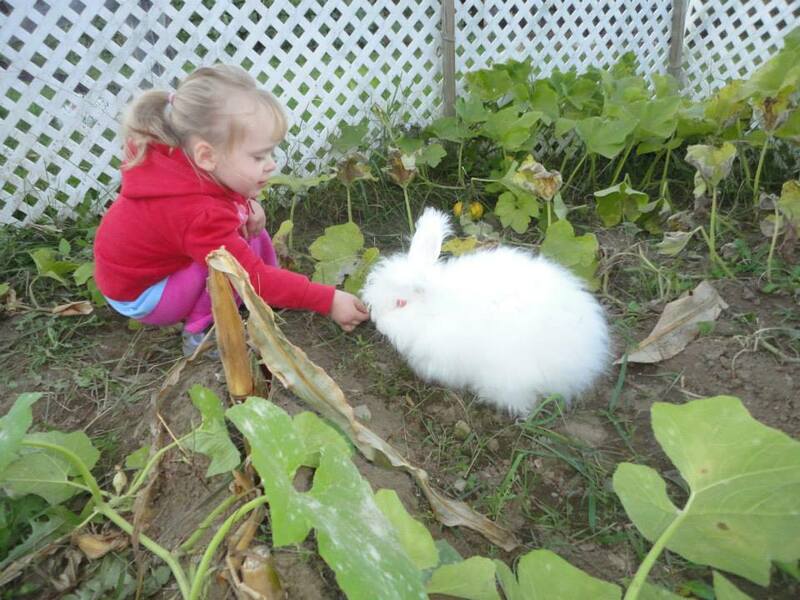 The autumn harvest has begun! 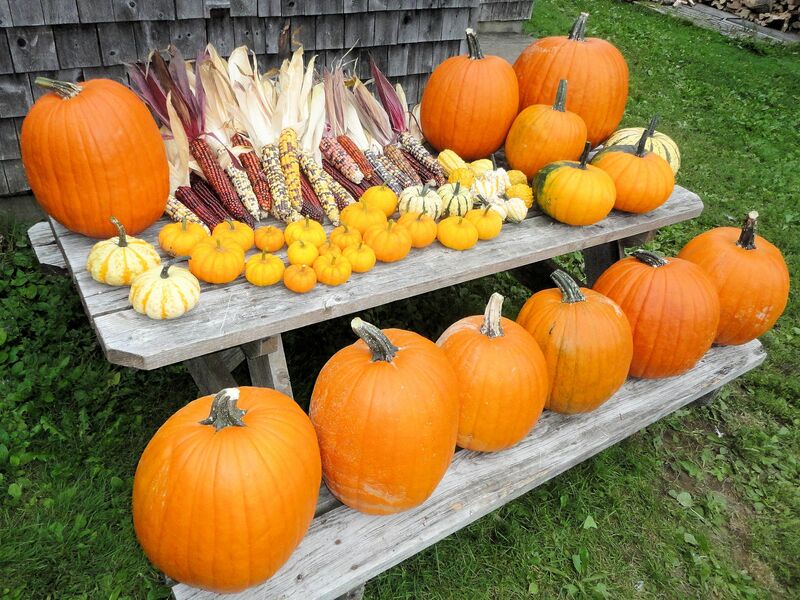 I found eleven big field pumpkins in the garden this year, lots of small Jack-Be-Little pumpkins, several winter squash, and a great yield of indian corn. 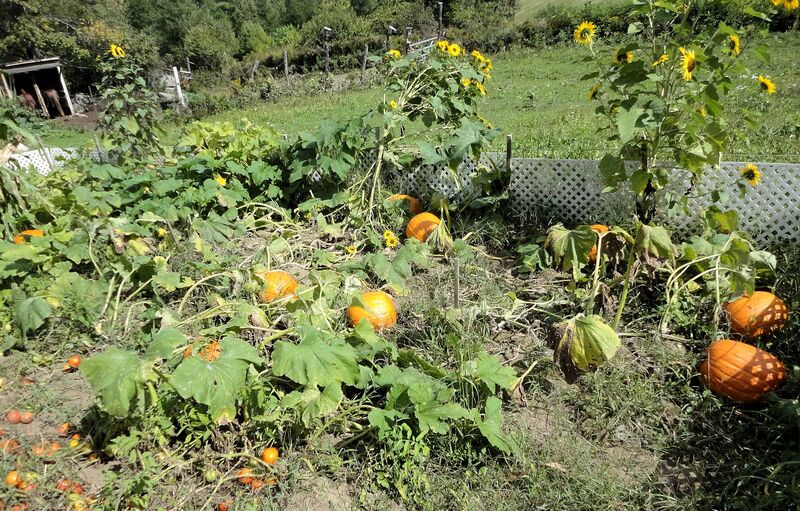 Some of the squashes and corn are still ripening, phase two of the harvest will be in a few days. The gourds are very plentiful. 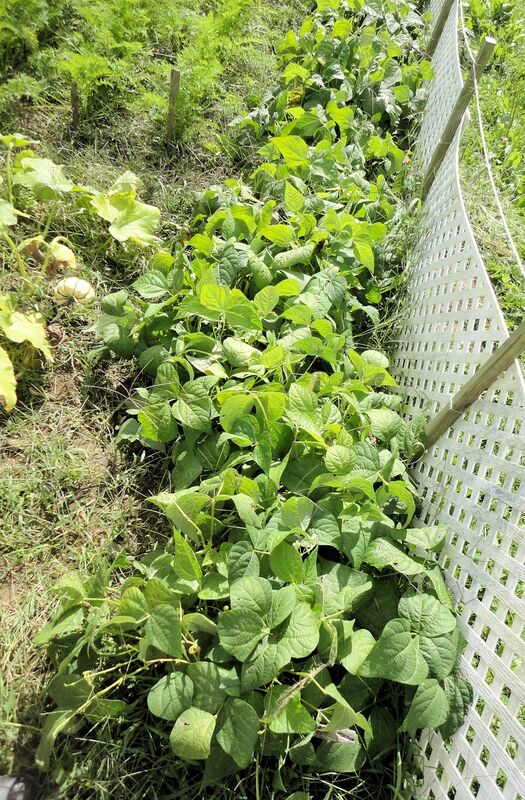 I won’t know how many grew until I can get onto gourd mountain after the first frost kills back the leaves. The strange hybrid crosses between squashes, gourds and pumpkins are providing plenty of excitement with their unusual shapes and colors. 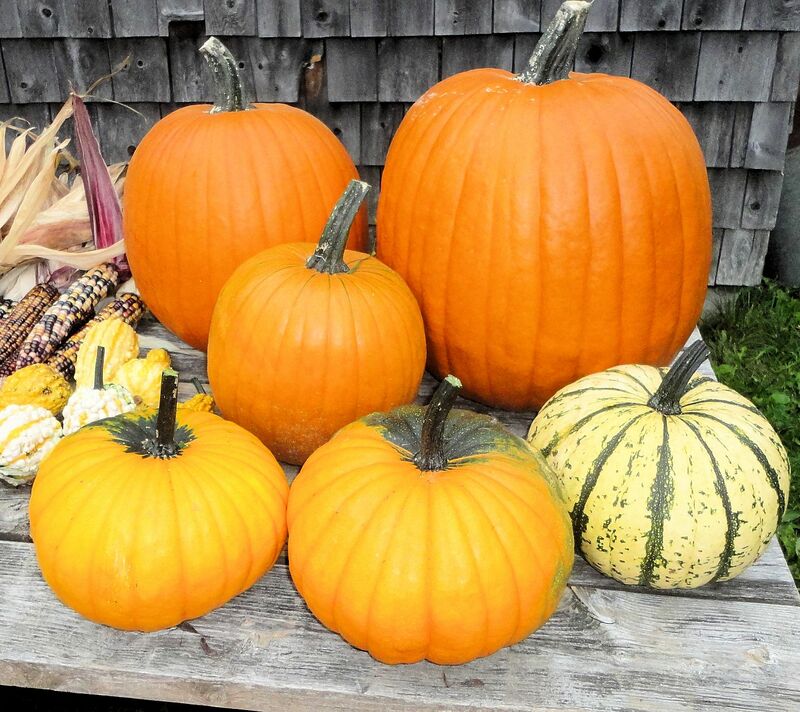 All are gourds, meaning inedible, except the large flattish orange ones near the pumpkins in the photos may be good to eat. I think they are a cross between pumpkins and winter squash. The tomato jungle is still producing and I must pick tomatoes again. A frost can not come too soon for the tomatoes as far as I’m concerned! 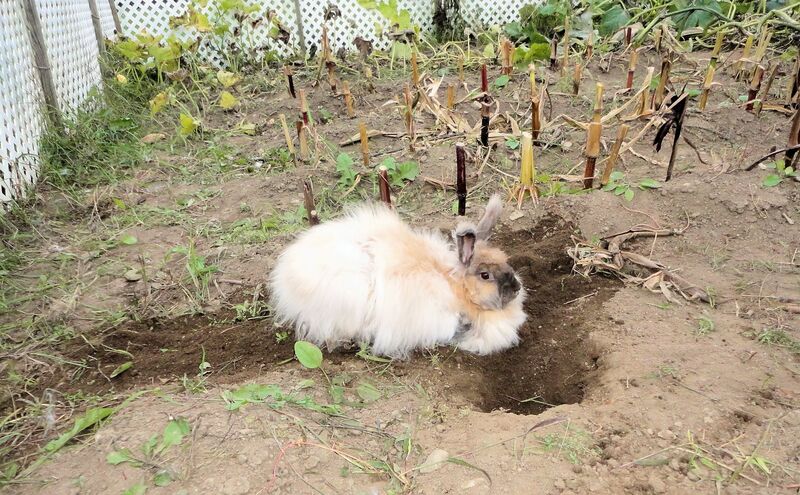 Also, it is time to pull the carrots. Think I’ll have my 2-year-old granddaughter, Lia, help me with them tomorrow. 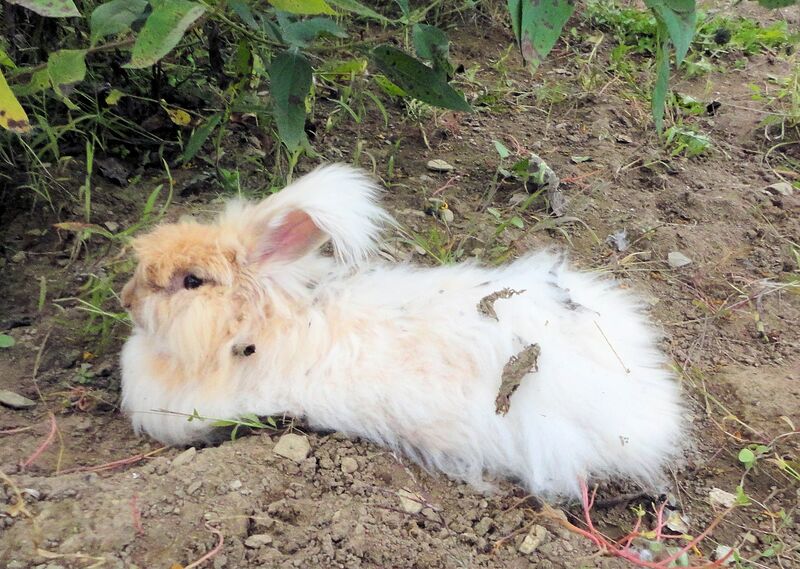 She loves to see the carrots come out of the ground. I train all my chickens to come when I call them. 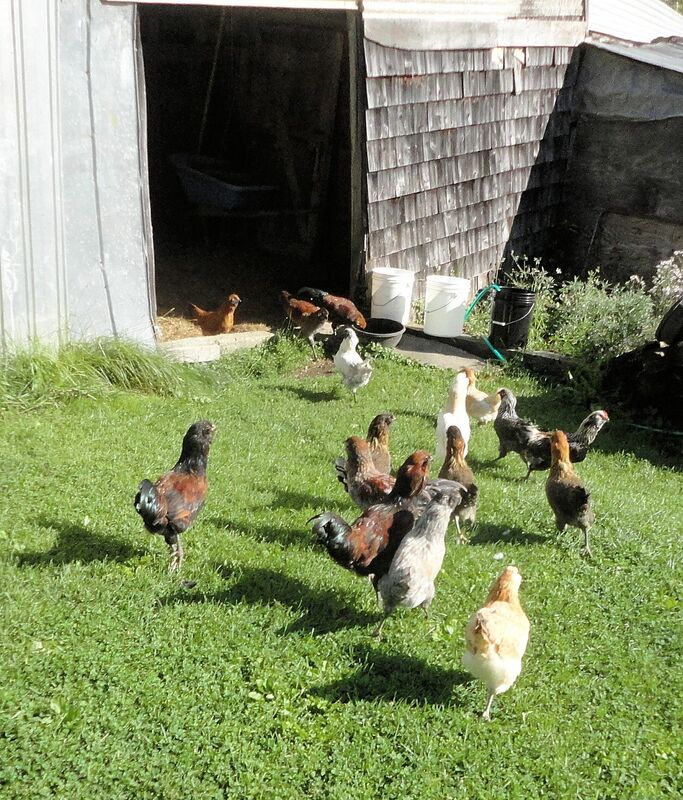 A loud clucking sound like the noise chickens make to tell each other there is something tasty to eat, combined with a high-pitched call of ‘chicken, chicken,’ tells the young birds it’s time to get their scratch grains. The chickens are so accustomed to having their morning treat of mixed cracked corn and whole oat grains that they hang around outside the house after they wake up, waiting for the human to appear. 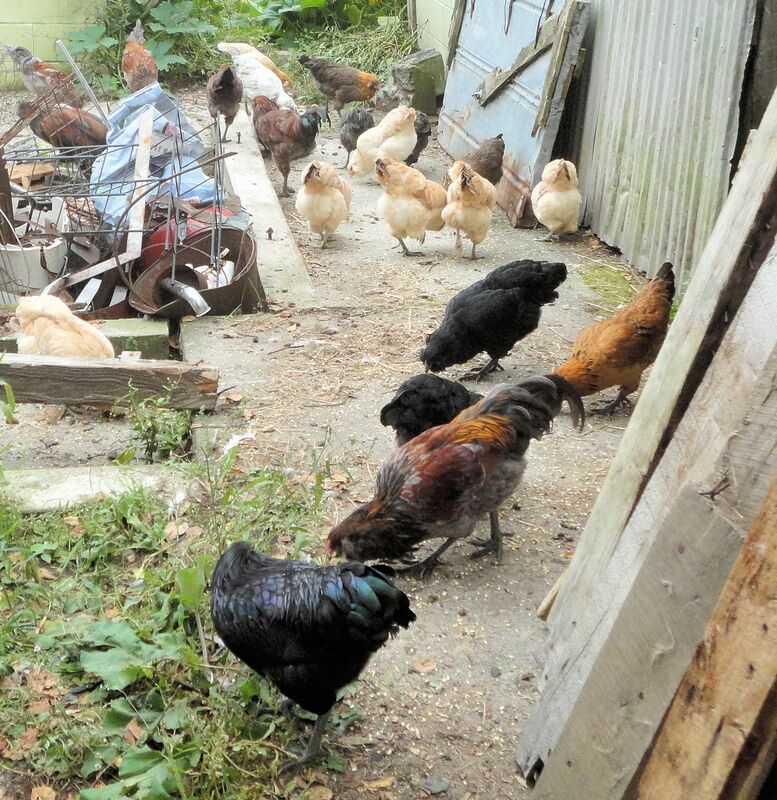 There are always plenty of poultry feed and free range pickings available, but the scratch grain must be so delectable that chickens will wait patiently for hours to get it. As soon as I appear at the door, chickens come running. They follow me in a long line down to the barn and stand around watching me expectantly until I get the marvelous treat out of the grain bin for them. 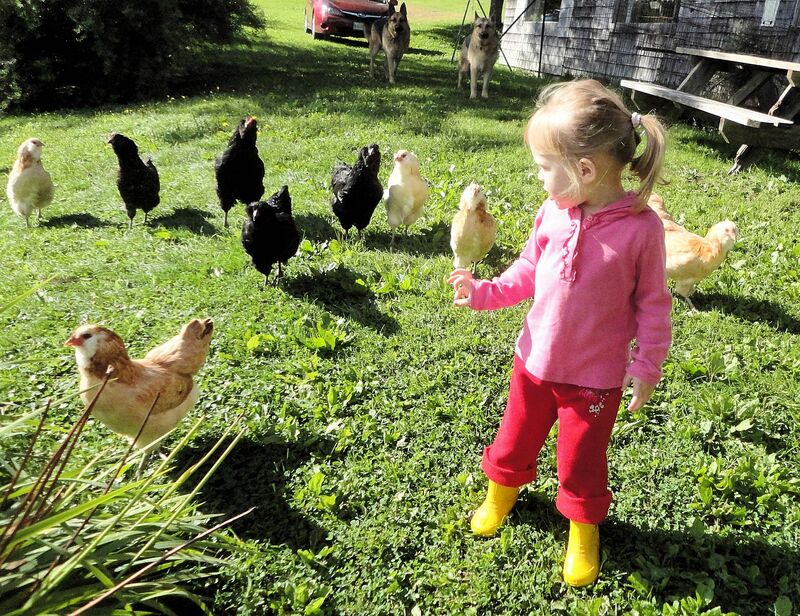 On days when my granddaughter Lia visits, she very much enjoys helping feed the chickens. The young birds trail after her now, too, since they have seen her dishing out the precious scratch feed. We spread the grain on the concrete floors of an old section of the barn that I’m tearing down. Lia is only two-and-a-half, but she has quickly picked up how to take handfuls of grain and scatter it around for the birds to eat. Then we like to stand back and watch them. I take this opportunity to count the chickens, assure everyone looks healthy, and make decisions about sorting them for future breeding or sale. The hand feeding helps to tame the animals, making them more interested in humans, more trusting and less prone to panic. Some of the birds are so friendly they will let me approach and gently scoop them up. They also shadow me during other times of the day and talk to me in their funny chicken language. Perhaps trying to convince me to hand out more scratch grain. 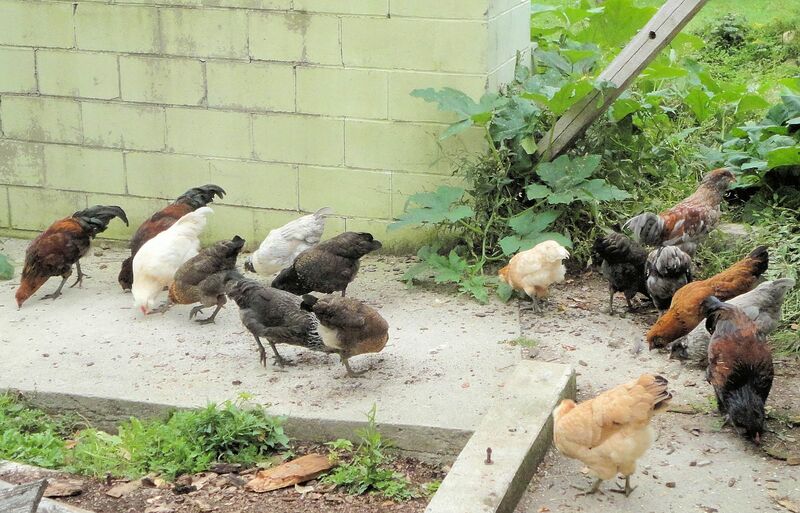 Garden with second hatch (June 3) of Ameraucana chicks. 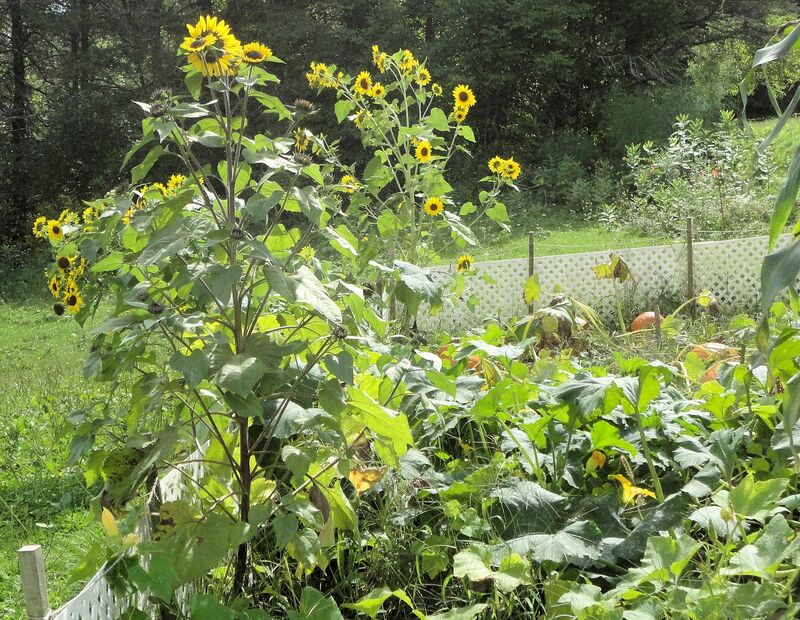 The Harvest moon has passed without a frost and the garden is still booming in September. The fence has worked well so far this year. 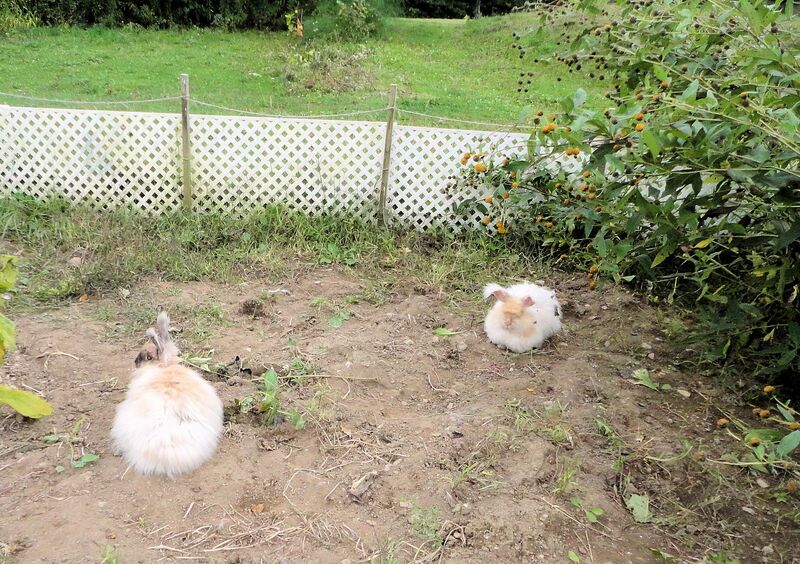 No chickens or other undesirables in the garden. 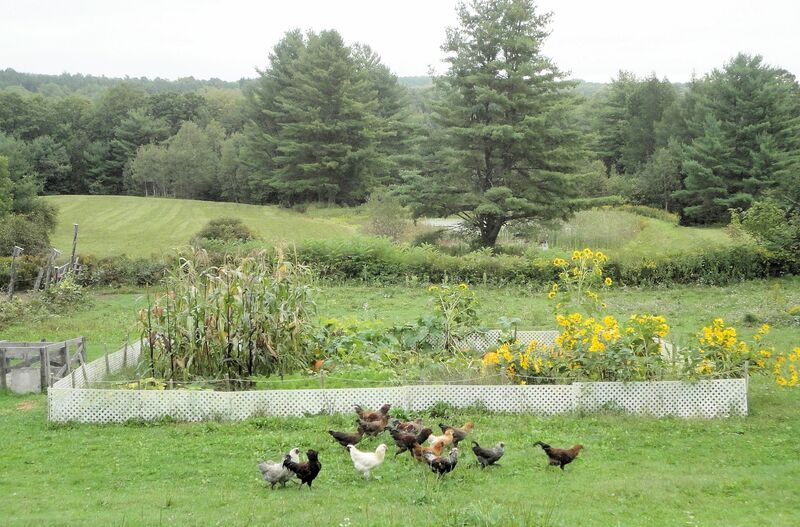 Above, the 15 young chickens from the second hatch run by the garden with no thought of the juicy tomatoes and squash inside. Things are beginning to wind down, the bean harvest is finally over. I pulled the plants yesterday. We have 19 pints of wax beans put up for winter. As I uprooted the bean plants I also weeded, and the area looks nice and neat. 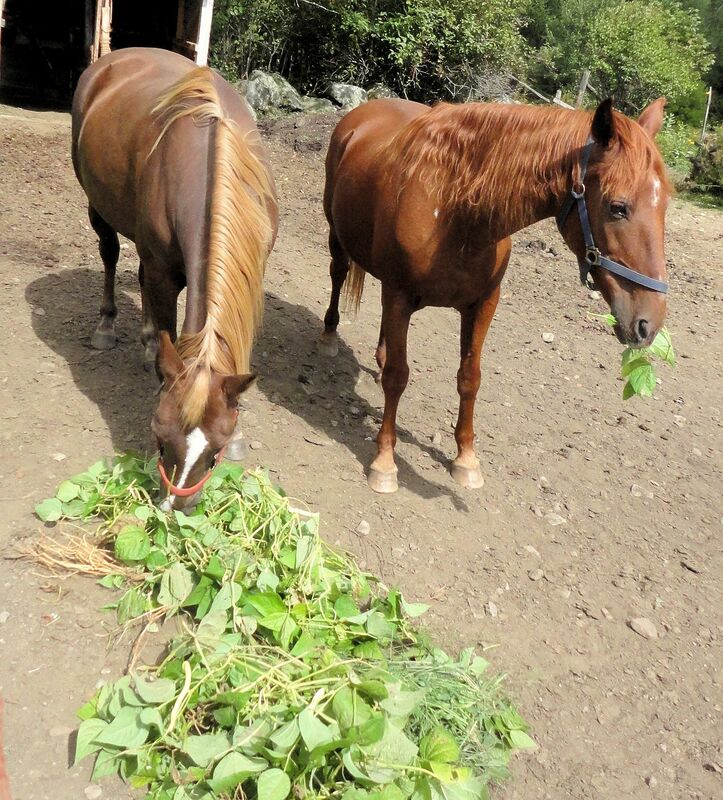 My horses enjoy bean plants and were happy to provide their unique composting services. 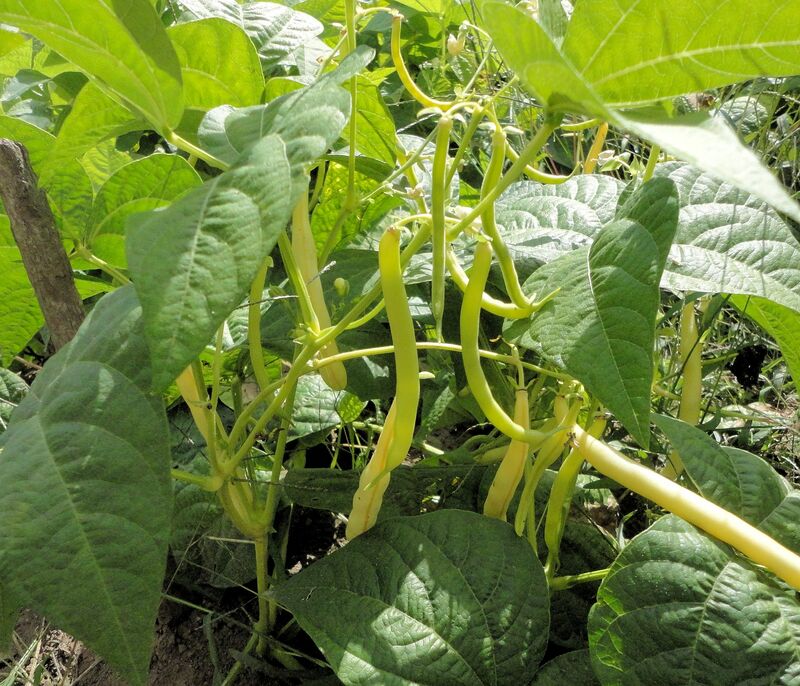 While the string beans produce one major harvest, and several smaller ones, they continue to bloom up until frost. If left in the garden, enough beans for a meal form every week. 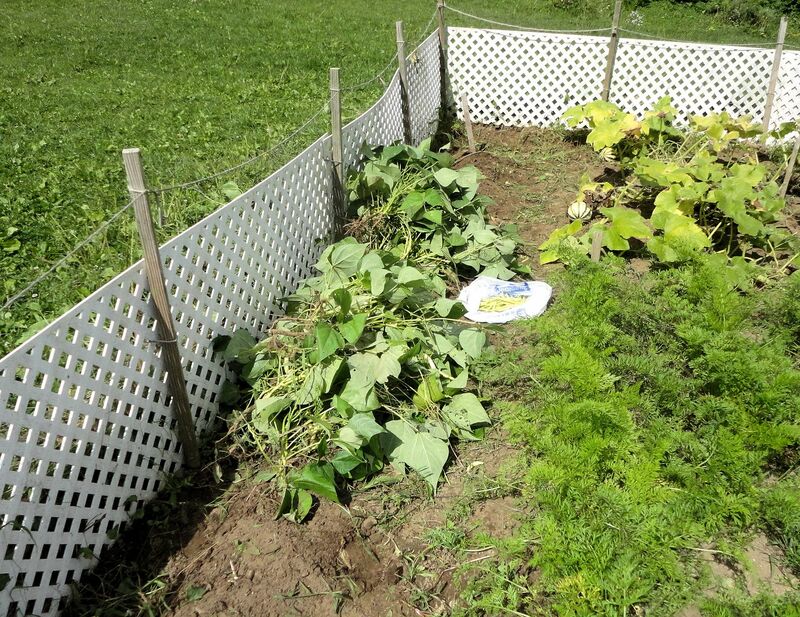 The winter squash plants are visible on the side of the photo to the right. They are nearly ready to pick. Bachelor buttons are about done for the year. They were so pretty. 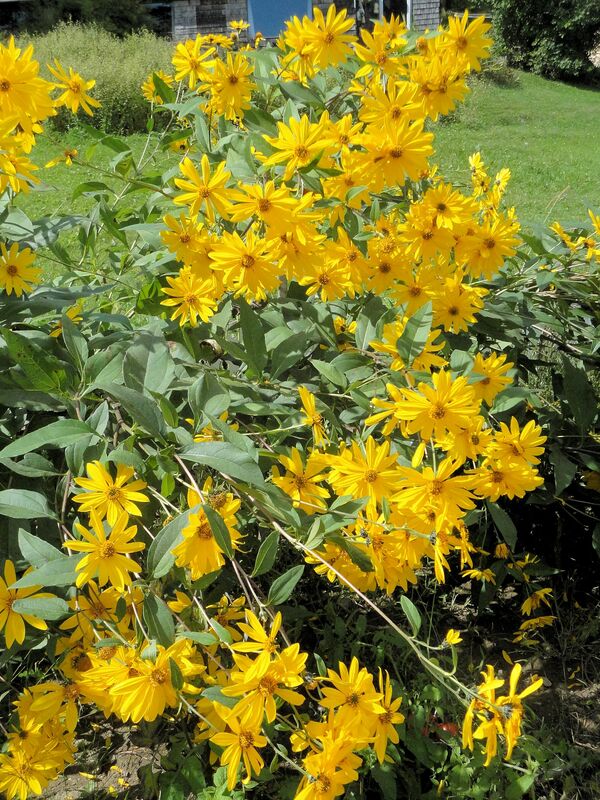 The Jerusalem artichokes are in full bloom. The heads of flowers are so heavy they weigh the tall plants down, causing them to lean. Maybe I will proved them some support next year. The sunflowers also are finally in bloom. I lost one tall plant to high winds, snapped off at the base, so I have three plants. All are yellow. I was hoping for some orange or burgundy. Oh well. 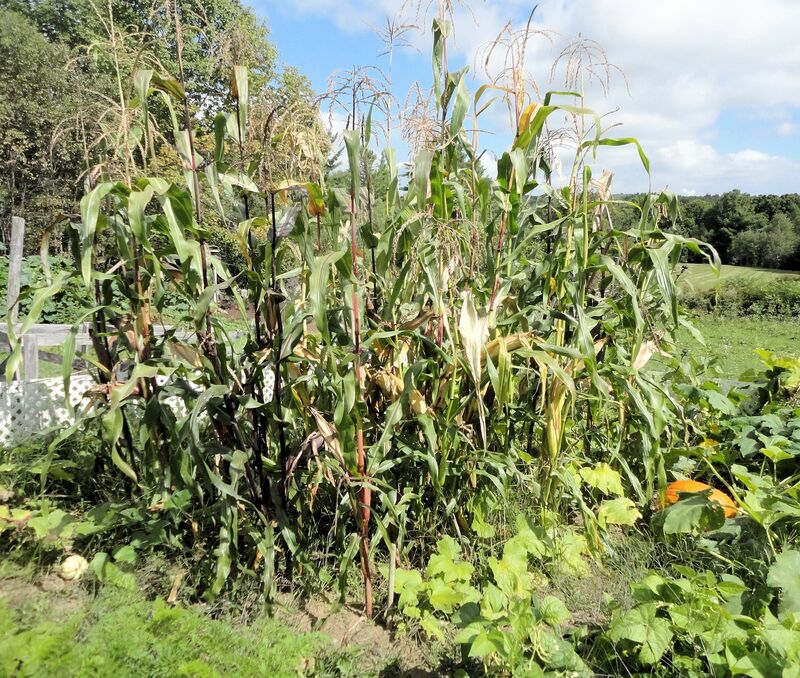 Indian corn has ripened and is now ready to harvest. 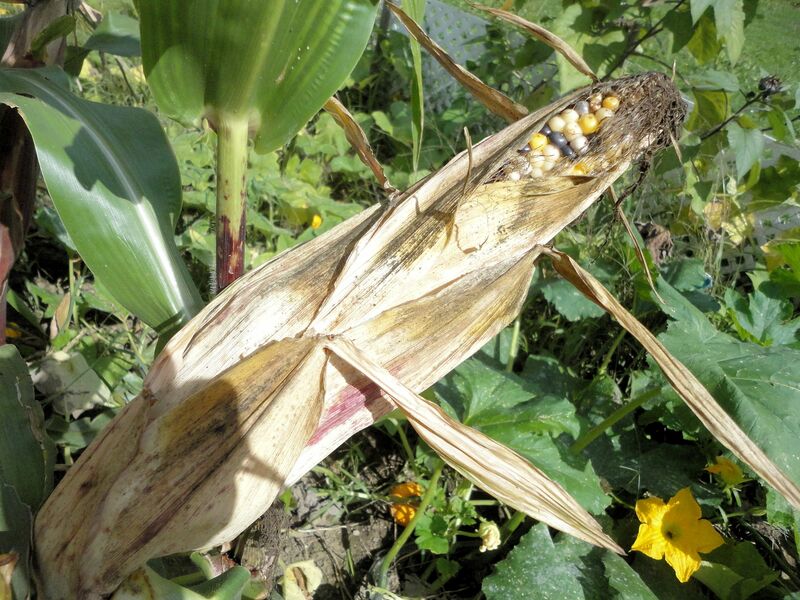 The husks of the ears are drying and shrinking back from the tops of the cobs. Unfortunately this exposes the corn to hungry birds and insects so I must pick all the ears soon. 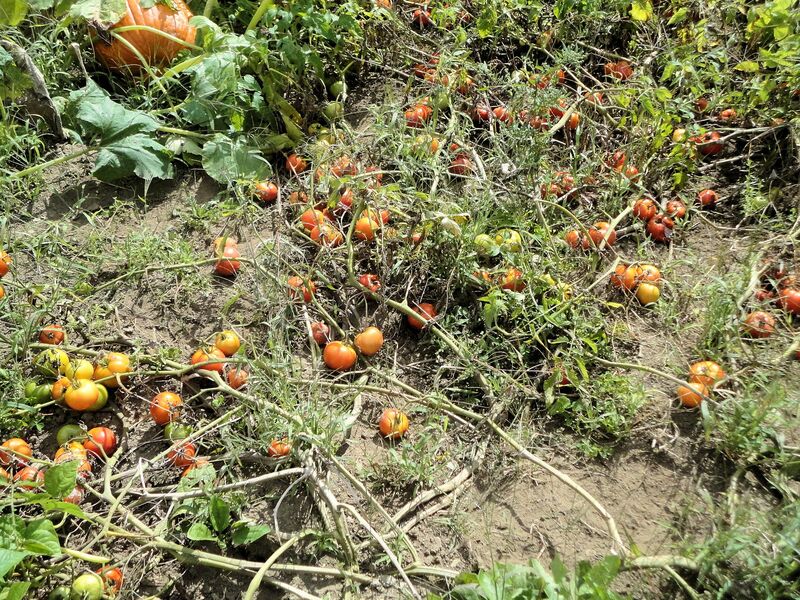 The tomato jungle continues to pump out fruit. I can not keep up with production. Many go to the chickens and horses, but that’s ok. We have plenty of tomatoes in the freezer and all the fresh ones I can eat and give away to unsuspecting friends. Most years I mulch the entire tomato patch with lawn clippings. I never managed to finish the job this year. The mulch is good for keeping dirt off the fruit and weeds down, so next year I will try harder to get this chore done on time. 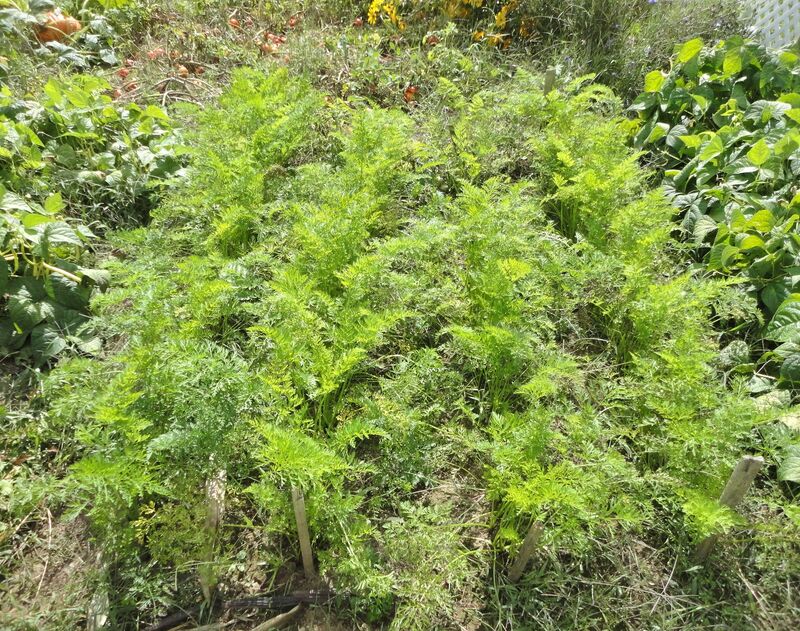 The carrots have recovered from their second thinning and are growing nicely. 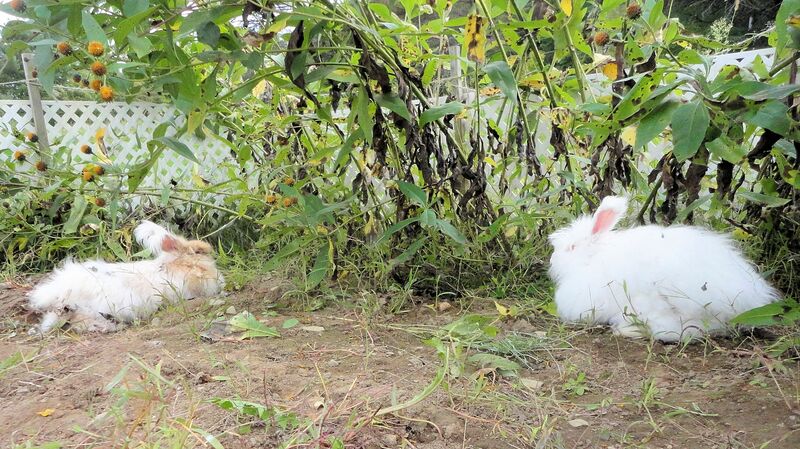 Harvest time is right around the corner for them. Also ready for harvest are the pumpkins. 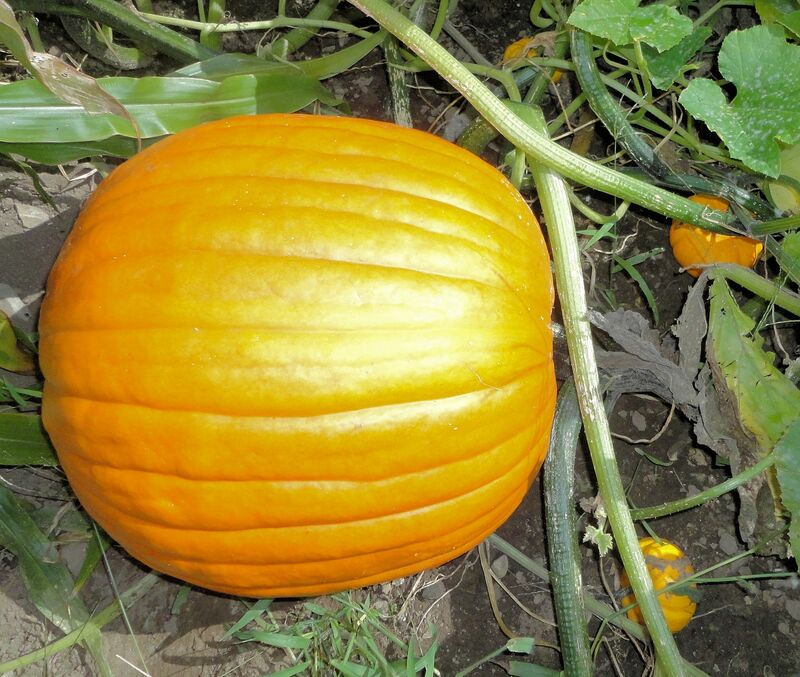 We have 9 large field pumpkins, many tiny Jack-Be-Little pumpkins, but no pie pumpkins. Those apparently failed this year. The gourds on the mountain look to be a plentiful harvest. 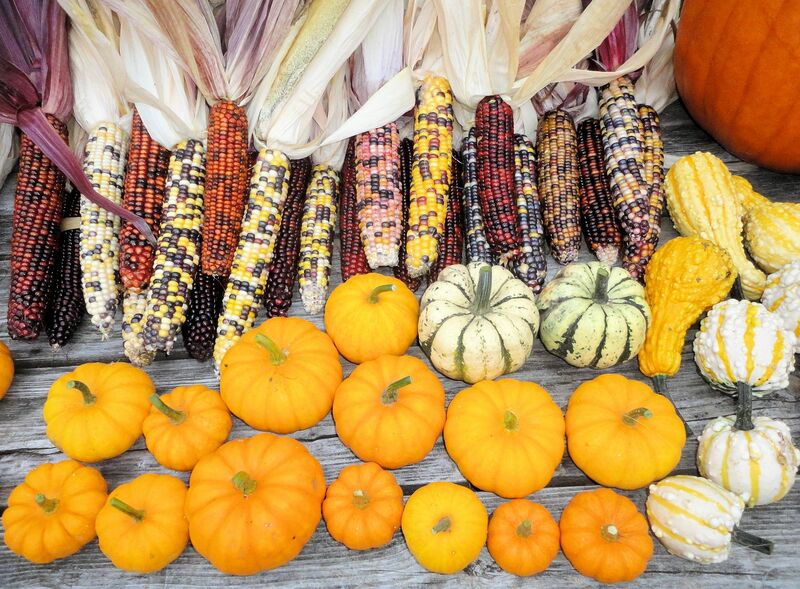 I may have to open a little roadside stand on one fine weekend in October to unload some of the excess squashes and Indian corn. We live on a high traffic road. On a warm, sunny fall day sales can be brisk.